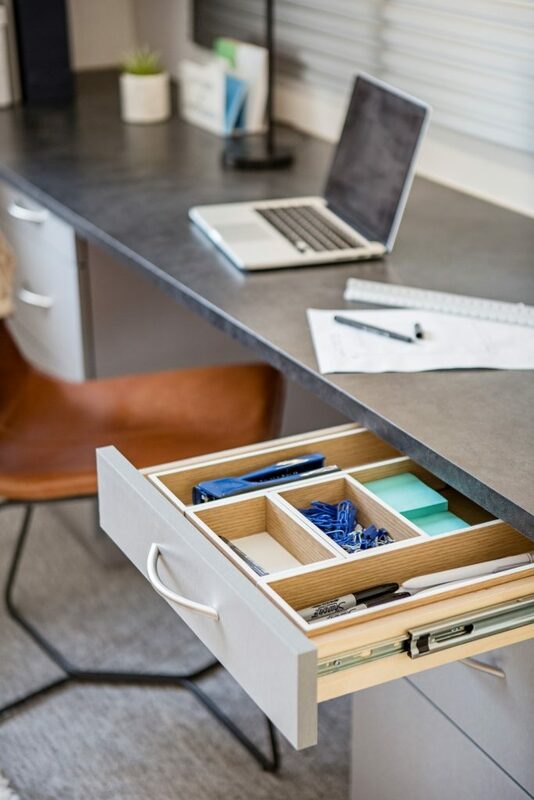 In the midst of summer, you might not be thinking back to school, back to the daily grind and chaotic schedule, but it’s quickly approaching and Tailored Living wants to help provide a stress relieving, organized and useful space for your home office. Tailored Living will maximize your home office space by designing workspaces for books, supplies and other work-related items along with personal décor to accommodate your personal style! “We offer a free in-home consultation to assess the client’s storage needs and determine how we can best utilize the space. All of our cabinetry is designed and custom-fabricated to fit in any space, whether it’s a designated home office, spare bedroom, closet, or another area,” says owner Jon Elliott. Tailored Living has a range of home office cabinet styles, finishes and accessories, so your office design can compliment your home’s distinctive style. Speaking of spare bedroom, many clients often need the space for a home office but also out of town guests. Jon elaborates, “Our murphy bed (wall bed) is a perfect solution for this scenario. We can design the room with both the murphy bed and office cabinets to accommodate open space for work activities without a bulky bed interfering with the daily grind.” In a home office, guest bedroom combo, capturing vertical space is also essential to provide practical bookshelves for books, supplies and décor. Whether you conduct company business or manage the household bills and scroll social media, let’s help you get organized and create the home office you have been waiting for with Tailored Living! Get started by visiting their website at tailoredliving.com or give them a call at 317-842-4272.